Cohen - and Donald Trump - are quickly learning it's much easier to use litigation as a business practice when you are only a business and not president. In the latest in a series of chess-like maneuvers, Stormy Daniels' legal team has amended her complaint in federal court to allege a new cause of action against one of Donald Trump's lawyers, Michael Cohen — this time for allegedly defamatory statements the attorney made, conveying the impression that Daniels, whose legal name is Stephanie Clifford, was a liar. On Monday night, Clifford's lawyer, Michael Avenatti, debated the new filing on CNN's AC360 with David Schwartz, an attorney for Cohen. As the argument heated up, Avenatti called Cohen a "thug" as many as 20 times. In response, Schwartz sarcastically thanked Avenatti: "That's a million dollars, a million dollars, a million dollars," he said, referring to the liquidated damages clause in the contested Daniels’ settlement agreement, and counting off a million dollars per "thug" reference. Meanwhile, the law firm representing Cohen has sent a letter to Avenatti alleging Cohen was defamed by Daniels' interview, specifically when they claim she intimated Cohen was responsible for an alleged threat against Daniels to keep her quiet. Cohen doesn't believe it happened and had nothing to do with it if it did, his lawyer has said. Even if Cohen is able to enforce the Daniels settlement agreement, the most he can hope for is to force the case out of federal court and into arbitration. He should not file suit for defamation; he will have an uphill battle if he tries to recover liquidated damages of a million dollars-per-occurrence under the Daniels’ agreement. And calling Cohen a "thug"? No million-dollar lawsuit will come of this. It's also not likely to warrant liquidated damages under the contract, either. (1) the harm caused by the breach is difficult to estimate; and (2) the set amount is a reasonable forecast of compensation for the harm caused. While the harm caused by Daniels telling her story is unknowable at this time, a million dollars for any statement whatsoever does not sound like a reasonable forecast of anything. Even if the liquidated damages clause is valid, the contract only allows "DD" to pursue liquidated damages. "DD" is alleged to be the pseudonym for Donald Trump in the contract. 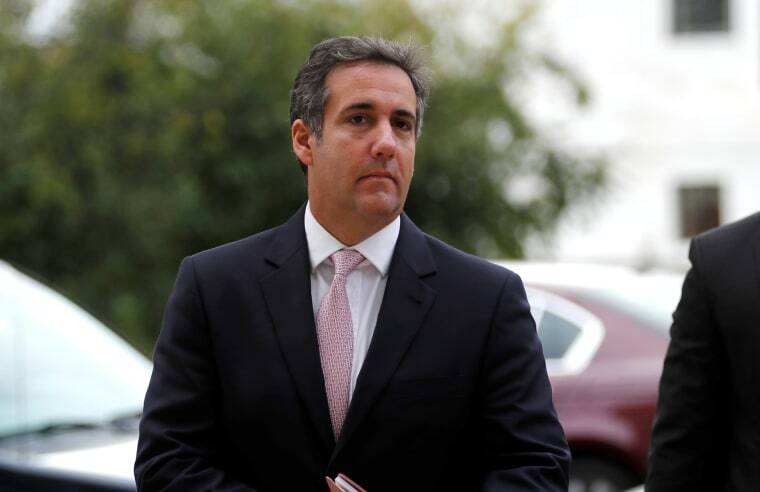 Cohen cannot pursue liquidated damages under the contract, nor can a company he set up, EC Consultants. Calling Cohen a "thug" does not violate the Daniels' agreement, and it doesn't trigger the liquidated damages clause, which a court might. Moreover, under the contract, only an arbitrator can award liquidated damages, not a court, which means Cohen would have to compel arbitration, under a contract that doesn't appear to permit Cohen to seek arbitration. Then again, at least one arbitrator has already been convinced by the Cohen/Trump team to hear this case, at least long enough to issue a restraining order against Daniels. That presumably means the arbitrator was convinced that Cohen or EC Consultants could enforce an arbitration provision which was only enforceable by "DD," in his stead. Could Cohen sue Daniels independently for defamation, based upon her lawyer's insults on television? As a general rule, a client can be vicariously liable for her attorney's defamatory statements, but only if the client authorized or ratified them. Avenatti’s words were improvisational responses to Schwartz’s barbs; Daniels had nothing to do with them. It makes no difference though. Cohen won't be suing Daniels or Avenatti, especially not for being called a thug by Avenatti. Cohen does not want to be in any court, as a defendant or as a plaintiff. Trump and Cohen are learning quickly that it's much easier to use litigation as a business practice when you are only a business and not the president of the United States. Trump denies any alleged affair with Daniels, according to his lawyer and the White House. Like Trump, Cohen does not want to be dragged into the discovery process, either. The scope of questioning in a deposition is too broad and too risky. Neither Trump nor Cohen should willingly subject themselves to testimony under oath right now if they can avoid it. That's why they are so eager to get cases into arbitration whenever possible. They may succeed in forcing some of these contract cases into arbitration. That doesn't mean they will have their liquidated damages clauses upheld. They cannot force any of the defamation cases into arbitration. Those will remain in court, as will the defendants.